Assuming the day of the year is the March equinox: the Sun lies toward the grey arrow, the star marked by a green arrow will appear to rise somewhere in the east about midnight (the Earth drawn from "above" turns anticlockwise). After the observer reaches the green arrow dawn comes over-powering[clarification needed] the star's light about six hours before it sets on the western horizon. The Right ascension of the star is about 18h. 18h means it is a March early-hours star and in blue sky in the morning. If 12h RA, the star would be a March all-night star as opposite the March equinox. If 6h RA the star would be a March late-hours star, at its high (meridian) at dusk. Any units of angular measure could have been chosen for right ascension, but it is customarily measured in hours (h), minutes (m), and seconds (s), with 24h being equivalent to a full circle. 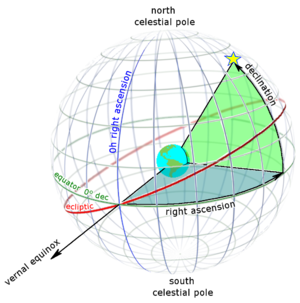 Astronomers have chosen this unit to measure right ascension because they measure a star's location by timing its passage through the highest point in the sky as the Earth rotates. The line which passes through the highest point in the sky, called the meridian, is the projection of a longitude line onto the celestial sphere. Since a complete circle contains 24h of right ascension or 360° (degrees of arc), 1/24 of a circle is measured as 1h of right ascension, or 15°; 1/24×60 of a circle is measured as 1m of right ascension, or 15 minutes of arc (also written as 15′); and 1/24×60×60 of a circle contains 1s of right ascension, or 15 seconds of arc (also written as 15″). A full circle, measured in right-ascension units, contains 24 × 60 × 60 = 7004864000000000000♠86400s, or 24 × 60 = 7003144000000000000♠1440m, or 24h. ^ U.S. Naval Observatory Nautical Almanac Office (1992). Seidelmann, P. Kenneth, ed. Explanatory Supplement to the Astronomical Almanac. University Science Books, Mill Valley, CA. p. 735. ISBN 0-935702-68-7.